Mary Catherine Hill was born about 1875, and was a lifelong resident of Berrien County. She first appears in census records in the Census of 1880, as a child in the household of her parents, Betty Newbern and William J. Hill in the 1148th Georgia Militia District. Her father was a farmer, as were his neighbors Mack Bullard and William Avera. On Christmas Day 1891, M. C. Hill married J. 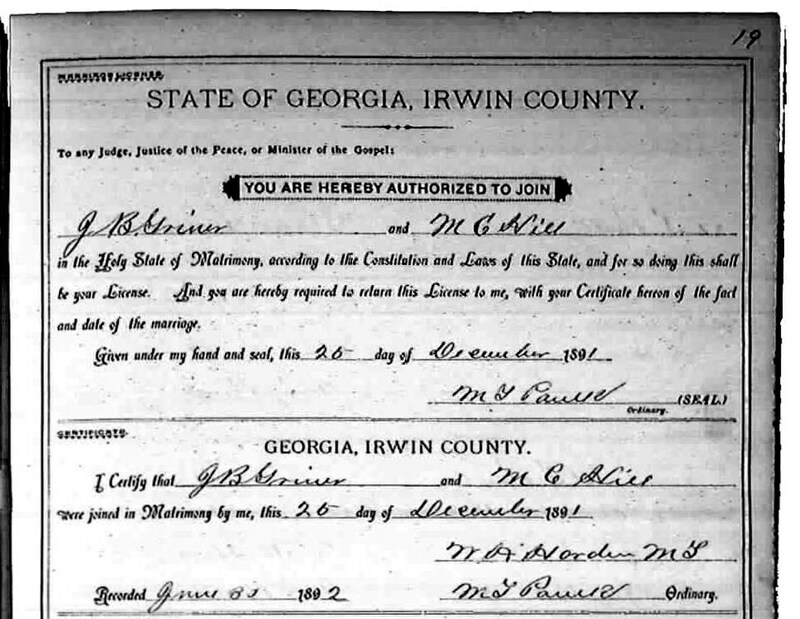 B. Griner in Irwin County, GA.
Mary Catherine Hill and James B. Griner were married Christmas Day, Dec 25, 1891 in Irwin County, GA. The couple made their home in Nashville, GA where Jimmy engaged first in farming, then took a position as deputy for Berrien County Sheriff, I.C. Avera. Some time after 1930 Jimmy and Catherine moved to Ray City, GA. Mary Catherine Hill Griner remained a resident of Ray City, until her death in 1940. Mrs. J. B. “Jimmy” Griner, 65, died June 24, 1940 at her home in Ray City, GA. She was a daughter of the late William J. and Betty Newbern Hill. Mary Catherine Hill married Jimmy Griner in 1891. Burial was in Flat Creek Cemetery. Survivors: Her husband and the following children: Lucius E. Griner of Lake Wales, Fla.; J.R. Griner of Ocilla; Mrs. Vinnie Robertson of Illinois; Mrs. Emma Overstreet of Tifton; Mrs. Ethel Sutton of Hollywood, Fla; Miss Mimmie Griner of Ray City; Mrs. Cleo Allen of Ray City. She is also survived by three brothers and two sisters.